How many emails do you receive a day? If you are anything like us your inbox is flooded with messages daily; some you open and some you delete without so much as a glance. Now think about the emails you do open. Do you read them? Do you click on the links? Do they persuade you to make a purchase? Email marketing can be a great way to nurture prospective buyers and generate sales, but the competition for attention is steep! So what makes your emails stand out from the rest? There is an art to creating a compelling, eye-catching email and this art is the difference between a sale and the trash can. Consider what encourages you to make the leap from skimming to clicking. Maybe the title grabs your attention or maybe it’s a sleek, clean layout. 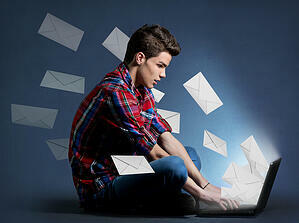 Whatever it is, try to think about whether or not your email campaigns include these aspects. These things are bound to increase your email conversion rates, which will in turn raise your sales and ROI. So if you aren’t seeing these things in your business’ emails it’s time for a change! The title is the first thing you see and it’s likely the deciding factor on whether or not you open an email. In order to increase your open rate, make sure your subject clearly states what your email includes. '20% Off for New Customers' sounds better than 'Discounts for New Customers'. It’s more direct and gives more information. In the body of the email, make sure the title stands out. Consider making it a larger font, bold or a different color. But make sure it flows within your email’s overall design; otherwise you risk deterring prospective buyers. What do I have to do to get this deal? Frankly your readers shouldn’t even be hesitating to ask. Not only should the Call-to-Action (CTA) be visible, clear and not surrounded by clutter, it should include simple, well-stated directions on what to do. With CTAs, less can be more; especially when we are talking about the steps you are expecting readers to take to redeem your offer. The longer and harder you make someone work for your offer the greater the chances are they will give up. Narrowing it down to 2 or 3 steps is a reasonable amount, with the first step being some type of 'click here' that will direct a prospective buyer to your landing page created specifically for this offer. And by specifically I mean it is clean, clear and contains no additional advertisements or distractions. Landing pages are important because they lessen the steps and make it easier for the reader to redeem your offer. Another thing to keep in mind is the speed at which your landing page loads. It should be fast and this will happen if your design is streamlined, for example, you should not be including several animated gifs or high quality images on this page. And back to that less is more idea; it’s a good idea to include only 1 CTA per email. By offering two or more things you began to complicate the email and we all know what happens when things get too complicated, right? Helpscout ran an A/B test with a single CTA versus multiple CTAs in an email. They saw a 17% increase in conversion rates from the single CTA email. That’s a pretty good increase so if you’re still having doubts about our last point, set up your own A/B test to see what appeals to your readers. The main reason I decide not to open an email is because it doesn’t pertain to me. Maybe I’m not interested in the subject or it’s not an offer I would want to redeem. And after a few irrelevant emails from a company, I barely glance at the title and don’t even consider opening them. I just assume that their email isn’t something I am interested in and the next thing I know I’m unsubscribing. Segmenting your email list is not a difficult task to undertake and will greatly increase your click-through and conversion rates. Mailchimp reported that segmented customers had a click-through rate that was 21% higher than normal. That’s great and it makes sense! Personalization is important; it makes the reader feel special and also shows them you are not going to waste their time with unnecessary emails. By engagement level. You could even send a “re-engagement email” out to any inactive members you currently have. By persona, like gender or job title. Consider your readers, brainstorm with your team and start segmenting! We can guarantee you will see some immediate results in your conversion rates. Content is king! We have said it before and we will probably say it hundreds of more times. Your emails should be engaging and enthusiastic about the product, your company or whatever the subject may be. Your content should invoke an emotional response with your reader; make them laugh, make them care and most importantly, gain their trust! Use captivating headlines to catch their attention. Make the content scannable by using bullets or breaking up large paragraphs of text. Write for your reader by using the correct language. Include keywords while keeping it natural. Include links that direct the reader back to your webpage or blog. Utilize this method to keep your email simplified, for example, instead of explaining something in detail in your email, link the word or sentence back to a blog post or a section of your website where you have already done this. Proofread for typos! I know this may sound obvious, but typos look terrible. They discredit you and make people lose trust in your company. So proofread, proofread again and then ask someone else on your team to proofread it before you send it out. This initial email is a great way to be in touch with new subscribers to thank them for signing up and let them know what to expect. Maybe you want to let them know how often they will be receiving an email from you. You might also consider sending them a welcome initiative or an offer specifically reserved for new subscribers. This is the start of your relationship and this email is one of your first impressions. Make them feel special and encourage them to engage with you. This is also a great opportunity to direct them to your social media pages or your blog so that can start following you on other networks. But what’s the best part about the welcome email? It can be automated! The minute a new subscriber signs up for your mailing list they will receive this email from you without you having to do a thing (well, aside from creating the email to begin with and keeping it up to date, of course). The key to the reminder email is to understand the buying cycle of your customer. Did they buy a subscription to a service you offer? When does it expire? Instead of letting their subscription run out and hoping that they decide to renew, send them an email. Maybe you could even include an incentive to sign up for a longer subscription. Make it easy for them to renew by including a link in your email where they can accomplish that in one click. The easier you can make this process the more likely they are to do it the minute they receive the email. If it gets complicated you risk them filing it to deal with later, which may never happen or worse, deciding not to renew at all. And guess what? These emails can be automated too; making it easier than ever to stay on top of your customer’s buying cycle. …is an email well read. At least that’s the plan and it’s a great first step to increasing your email conversion rates. Run A/B tests to see what your readers respond better to with regards to content, layout and design. Test your email in multiple browsers and platforms. Constantly monitor your click-through rates, open rates and bounce rates to see what is the most popular. Have you seen an increase in your email conversion rates with a technique or change you have made? Comment below and tell us what is working for you!